Despite the weather, there’s always ‘Sunshine on Leith’. An area like no other, it is built around The Shore – the city’s original docks. Serving as a port from the 12th century, it has been the location of many significant events in Scottish history. Mary of Guise ruled Scotland from her home here while Mary Queen of Scots was in France during the 1560s. The port was where King George IV entered Scotland, and Leith Links was a popular golf course for Charles I and James VII. 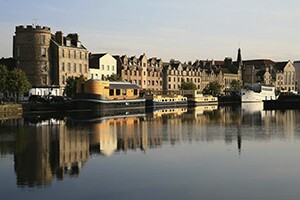 Birthplace of The Proclaimers (band), Leith is the inspiration for the song and musical Sunshine on Leith. It is also the birthplace of Irvine Welsh (author) and the setting of his most famous novel, Trainspotting. A vibrant centre for creativity, the neighbourhood is full of restaurants, bars, cafes, shops, attractions and galleries. The area even boasts its own festival, magazine and market. Properties in Leith vary from trendy warehouse conversions, traditional tenements and modern developments to traditional townhouses. Leith Links offers 46 acres of green space right on the neighbourhood’s doorstep. A centre of culinary excellence, The Shore hosts two Michelin star restaurants – The Kitchin and Restaurant Martin Wishart. It’s not short of pubs, bars and restaurants with popular haunts such as Fishers, The Ship on the Shore, The King’s Wark, Mimi’s Bakehouse, The Lioness of Leith and The Roseleaf in the area. It is also the home of the Royal Yacht Brittania – named Scotland’s Best Visitor Attraction by VisitScotland. Brittania is docked next to Ocean Terminal, where you can find shops, restaurants, cafes, department stores and a multiscreen cinema. It is a quick journey into the City Centre with excellent bus links and easy car routes to other parts of the city. If you have a car, many properties in the area have private parking or free on-street parking. There are a number of excellent local Primary Schools, including Leith Primary School and St Mary’s RC Primary School. It is in the catchment area for Leith Academy and Holyrood RC High School, but is also in easy reach of a number of public schools including Erskine Stewart’s Melville Schools, St George’s School for Girls, The Edinburgh Academy and Fettes College. At the end of Leith Walk (EH7) and Easter Road (EH7), it is also close to Abbeyhill (EH8), Newhaven (EH6) and Hillside (EH7). Luxurious modern two bedroom apartment in Leith. Stylishly furnished property within a new build development offering the benefits of private parking, bike storage and lift access.